The gallery will be showing the work of approximately fifty skilled craftspeople and fine artists along with a featured 2 person show “Fish, Fowl and Flowers” showing wood carvings of fish and fowl by Bill Barnard and flower photography by Richard Conrad. 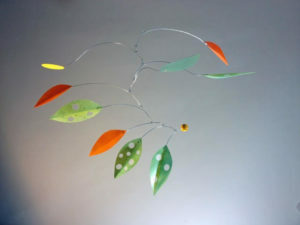 Three studio venues are within walking distance of the BAG: Using colorful handpainted papers, plastic, metal, and other decorative materials, Patty Sgrecci creates art in motion — moving sculptures and mobiles. She will demonstrate how she achieves the art of balance in The Granary at 29 Union St. Warren Kimble’s home studio will be open at 40 Park St. where he is hard at work preparing for a featured show at The Guild, opening June 30th. Kimble is known for his signature folk art of animal, barn, and homestead scenes on antique wooden boards and other found objects. Judith Reilly will be at her sewing machine in her studio at 24 Conant Square. Be sure to stop in to see her freestyle stitching techniques as she creates new whimsical fabric art. Her latest hooked rug designs will also be on display. Just a few miles away Laura Rideout will be demonstrating stained glass techniques at 8 East Prospect St. You’ll want to see her collection of stained glass panels and sun catchers. 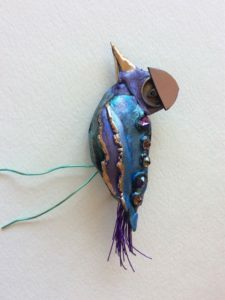 Drive to 519 Lover’s Lane to find Jill Listzwan’s studio where she’ll be creating one of a kind jewelry from mixed media. Color and whimsy unite in her fun collection. Other BAG members showing work outside of Brandon are Karen Deets stained glass in Fairhaven, Stacey Stanhope ceramics in Orwell, Mike Mayone paintings in East Middlebury and Norma Jean Rollet’s pastels and paintings in Middlebury. There’s so much to see, start planning your weekend now! 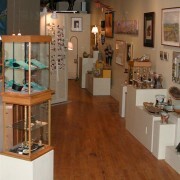 The visiting times for Open Studio Weekend, are 10 AM to 5 PM, Saturday and Sunday, May 27 & 28. For maps and more art, the Brandon Artists Guild is at 7 Center Street, Brandon. Look for yellow signs.